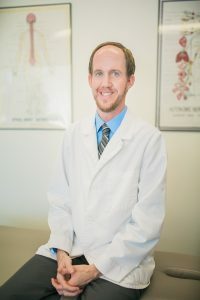 Dr. Ryan Smith grew up in Oglesby, attended LaSalle-Peru Township High School, Illinois Valley Community College, Northern Illinois University, and finally Palmer College of Chiropractic in Davenport, Iowa. Since graduating in 2004, he worked in a large chiropractic office in Bloomington, IL. Dr. Smith had the opportunity to train under many successful doctors in his field as well as take over 100 hours of postgraduate courses to become Board Certified in a specialized adjusting technique called Atlas Orthogonal. This technique is specific to the upper neck, but it can help the whole body. It is very accurate, very gentle, and has helped people of all ages, from infants to the elderly. Dr. Smith became interested in chiropractic when he felt the relief of tension headaches and mid-back stiffness after receiving chiropractic care. At Palmer, he saw a chiropractor on a regular basis and realized that his headaches disappeared, and he hardly had any allergy symptoms or colds (which he used to have every few months) since starting chiropractic care. Since 2004, Dr. Smith has been able to help others just like he has been helped, as well as people with migraines, debilitating back and neck pain, asthma, acid reflux, and many other problems that one would never think that chiropractic could help. After being away for six years, Dr. Smith moved back to the Illinois Valley area and opened Advanced Chiropractic in October of 2006. He lives in LaSalle with his wife Jennifer and daughter Eliana, and is excited to be helping the people in the community where he grew up. Dr. Smith is a member of the LaSalle Rotary, Illinois Valley Chamber of Commerce, is a board member of the Illinois Valley Community College Massage Therapy Program, and has helped with the March of Dimes.